WHEELING, W.Va. – The 14th annual WVU Medicine Children’s Gala, hosted by the Ohio Valley Friends of WVU Medicine Children’s, raised more than $97,000 for the WVU Medicine Children’s Transport Team, while celebrating patients and staff. 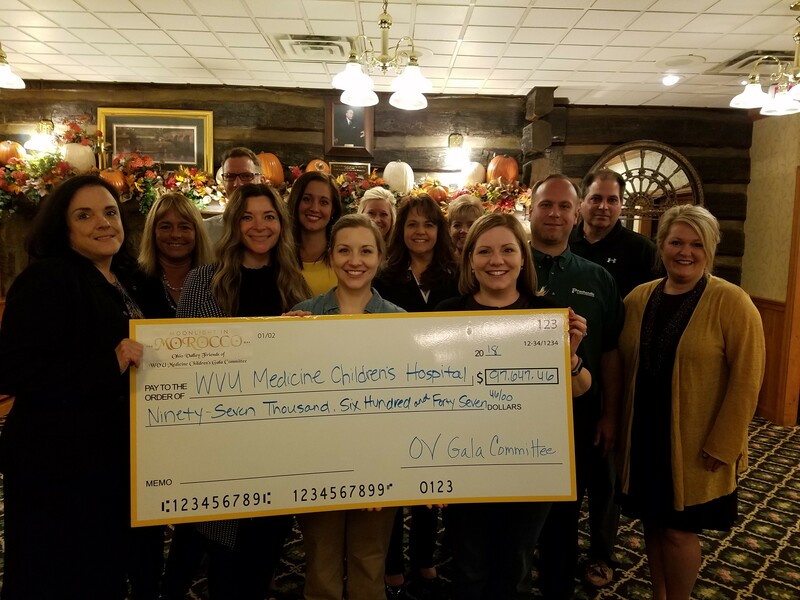 Janette Gidley, senior director of development and Cindy Liberatore, managing director of development WVU Medicine Children’s (front row, left) accept a $97,647.46 donation from the Ohio Valley Friends of WVU Children’s Hospital. The WVU Medicine Children’s Transport team serves critically ill pediatric, neonatal, and maternal patients who require intensive monitoring and continuation of intensive care therapies while being transported to WVU Medicine Children’s. Proceeds from the event were used to purchase a Tecotherm Neo cooling blanket, which is typically used to slow the progression of injuries and diseases in newborn babies at risk of developing severe brain damage. The “Moonlight in Morocco” themed gala was held at Oglebay Resort and included colorful décor, gourmet dining, silent and live auctions, and dancing to music provided by The Move Makers. More than 400 guests were in attendance, including members of the community, sponsors, hospital executives, and government officials. George Smoulder was recognized as the 2018 WVU Medicine Children’s Community Award winner for his nearly four decades of social service work in the Ohio Valley. Seven year old Thomas White was the night’s featured miracle child. He was transported to WVU Medicine Children’s Neonatal Intensive Care Unit in Morgantown shortly after his birth due to neonatal respiratory distress syndrome and severe jaundice. Premier sponsors for the event included Hartley Law Group, PLLC, Southwestern Energy, Gumby’s, LLC, Bordas & Bordas, PLLC, and Panhandle Cleaning & Restoration.